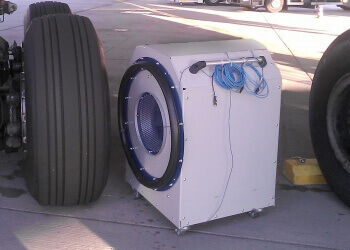 Cool the brakes on aircraft running gear quickly and efficiently with the LTG Brake Cooling System (BCS). The compact LTG Brake Cooling System was developed specifically for cooling the brakes on aircraft running gear. Rapid cooling within a few minutes. Designed for use with the A380 and Boeing 777. Mobile installation possible, without cables. A world-famous aircraft company and a major airport operator contacted LTG engineering services in order to solve an engineering problem. They asked LTG's expert engineers to develop a new concept for cooling the brakes of passenger aircraft after landing. The solution used up to that time was unsatisfactory and the turnaround time at the gate had to be shortened. LTG's task was to optimise the cooling of the brake discs and develop an easy-to-use product. After a number of preliminary studies a prototype was built: the LTG Brake Cooling System. Cooling was only one of the problems that had to be solved, as the device had to be mobile and work without cables. The reason was that aircraft can park in many different positions. Electrical outlets may not always be in the immediate area, and cables can create tripping hazards. This is why the housing of the BCS was mounted on wheels and power was supplied by rechargeable batteries. Before the system went into volume production, it was of course tested under realistic conditions at an airport. The results were more than satisfactory: brakes were cooled within only 15 minutes to a temperature that permitted the giant aircraft to take off again. Our product dramatically reduced the processing time. The airport operators had all the proof they needed: the BCS had proved far superior to all previous Solutions. 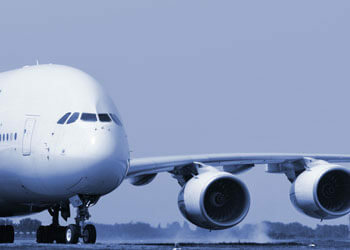 Airport operators worldwide trust in the LTG Brake Cooling System (BCS) in their movement area. Especially appreciated is its comfortable handling and efficiency, which helps jumbo jets quickly launch into the clouds again. The solution offered by LTG Aktiengesellschaft has already convinced reliably in wind, weather and cold at the international airports in Frankfurt, Dusseldorf, Vienna, Zurich and Singapore.